Decks have come a long way since people started to extend their homes beyond the typical patios. We still have plenty of treated lumber options where the pressure treated wood stands up to the elements. But there are artificial decking products, or “wood plastic composites” that have completely changed the market. For this blog, we are going to focus on one of our decking partners, Trex. Trex is the creator of wood-alternative composite decking and they use their proprietary technology to help homeowners create the backyard retreat of their dreams that is also “green.” Using 95% recycled wood and plastic film, Trek has eliminated harmful chemicals from their creation process. Rather than throwing wood away in the landfill, Trex reclaims locally sourced wood, mixes it with recycled plastic such as sandwich bags grocery and shopping bags and even the plastic holding your Sunday newspaper and manufactures the decking. In fact, Trex never cuts down a tree to create their boards. Plus, the average 500-square foot composite deck has about 140,000 recycled plastic bags! Think about how you have helped the environment the next time you are relaxing on your Trex Deck! We all want to spend time relaxing on the weekends on our decks rather than maintaining. After many, many years of use and weather, we all know what can happen to the treated wood. Eliminate the painting staining and sealing with Trex. There’s also a difference between Trex and other composites on the market: the weather resistant shell that will protect the deck for as long as 25 years or more! Want to create a double-decker deck and have a spiral stair case? 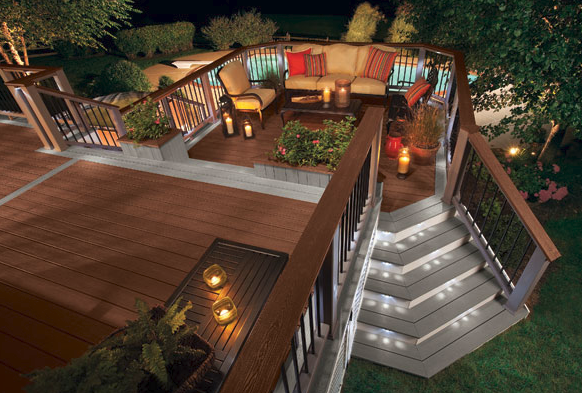 How about deck and landscape lighting as well as outdoor storage built in? What about a built in pergola? How about a deck drainage system for the two level deck? Trex offers these extra amenities for your deck project. It’s the little things, or big things that will make your new deck shine! Are you ready to stop working on your old deck and relax on your new one? Come and see us today at our showroom and we will walk you through the whole process. 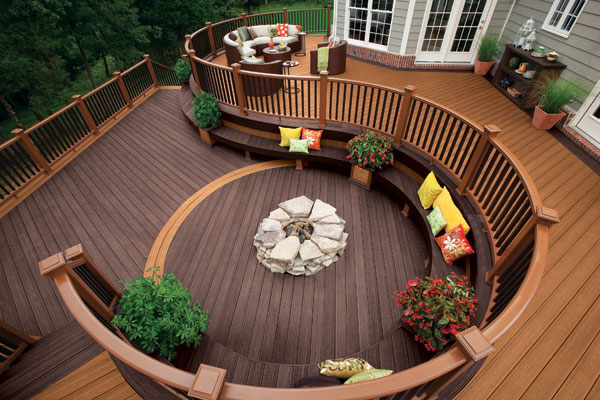 There is still time this season to have that deck of your dreams! This entry was posted in Decking and tagged deck drainage system, decking, Decks, Trex Decking, wood plastic composites. Bookmark the permalink.